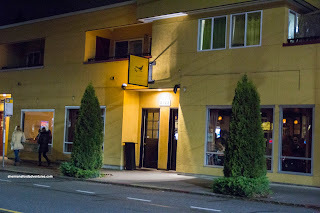 The last time I was in Seattle, which was in August 2018, I had planned to visit one of the hottest restaurants in JuneBaby. The reason? 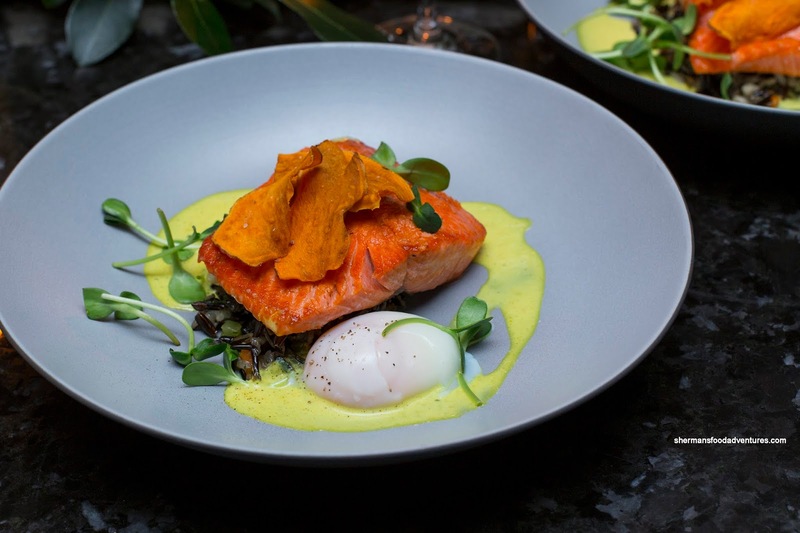 Head chef Edouardo Jordan picked up 2 James Beard awards in 2018 - Best Chef Northwest and Best New Restaurant in the country. Yes, those are some pretty big accolades! I never got around to JuneBaby, but this time around I would not be denied, even if it meant going on a Friday night. The plan was to arrive as it opened for dinner service at 5:00pm. It worked, we got a table right away, but there was a lineup and the room pretty much filled up instantly. 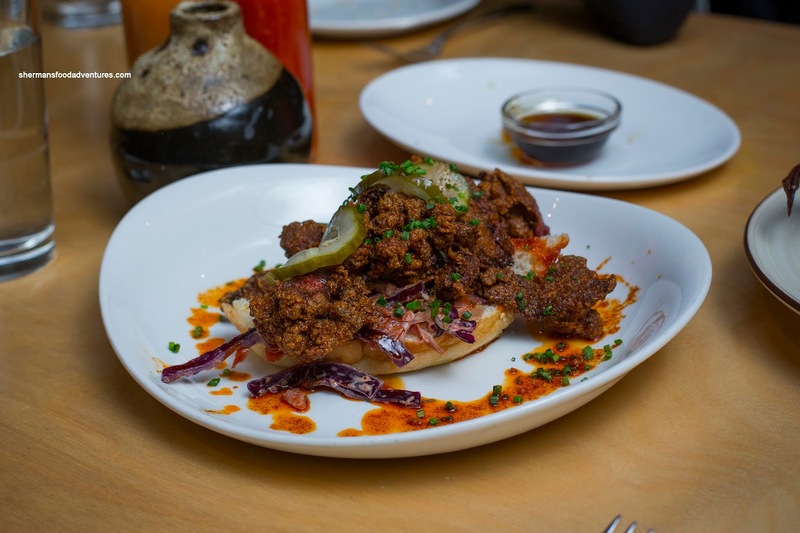 We got things started with the Nashville Hot Chicken Livers and the Fried Pig Ears. 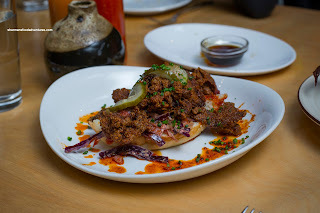 Looking pretty wicked, the livers were served on a Nancy Lee roll, pickles & coleslaw. Fairly crunchy on the outside and tender on the inside, the livers were fried beautifully. Each moist nugget was flavorful and of course with a kick. They weren't overly spicy which meant we could enjoy them without asking for milk. The pickles were not merely a garnish as they added a nice crunch and acidity. We only wished there were more. 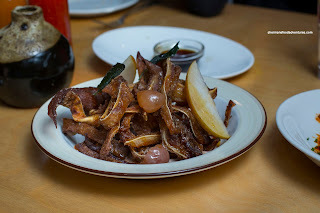 Light and almost airy, the pig ears were crunchy and exuded plenty of "porkiness". This was amped by the spicy honey and cooled slightly by the pecan butter. Pickled grapes added both sweetness and tang while the Asian pear added a light crunch. This was a great snack with my Standard Sour. Something that they are known for is their Buttermilk Biscuits with pure cane syrup. 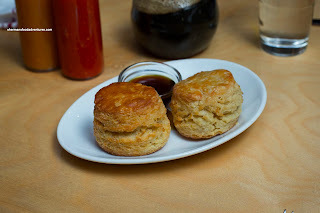 These were indeed good with fluffy and buttery internals surrounded by a firmly crunchy exterior. Although the crunch was super appealing and texturally on point, some parts were actually hard which made for a tough mouth feel. Loved dipping it into the pure cane syrup as the sweetness was a nice compliment while the depth of sweetness was somewhat complex. For our side, we chose the Southern Rice of the Day with Fried Shrimp. 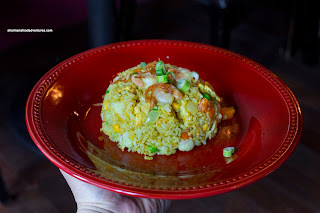 This was plenty flavorful with red and green peppers, onions and little nuggets of shrimp. There was a minor brininess that went with the sweetness of the peppers. 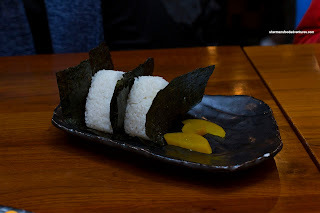 The rice itself was tender while retaining a bite. I found the fried shrimp to be perfectly cooked with a meaty snap. Unfortunately, they were a tad salty. For our mains, I went for Momma Jordan's Oxtails with root veggies and king trumpet mushrooms. Plated with 3 large oxtails, this dish looked fantastic and appetizing. I would say most of the oxtail was fork tender and fatty. As usual, the softened tendon of the oxtails were silky and delicious. However, some parts were rather dry. I know this will upset Momma Jordan, but I'll have to say it - the oxtails were far too salty. If it were served with white rice, I think it would've worked, but this was not the case. 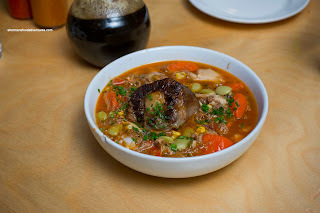 With the same salty oxtail, my daughter's Burgoo was quite tasty. 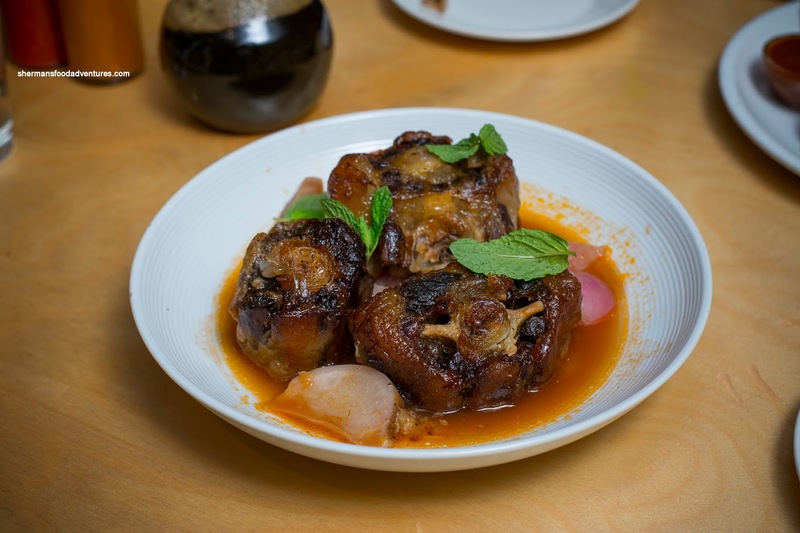 When we mixed the oxtail with the rice, broth, veggies and chicken, it added both depth and impact to a relatively mild dish. Loved how it was hearty and full of meat. Definitely a meal in itself despite being moderately priced. 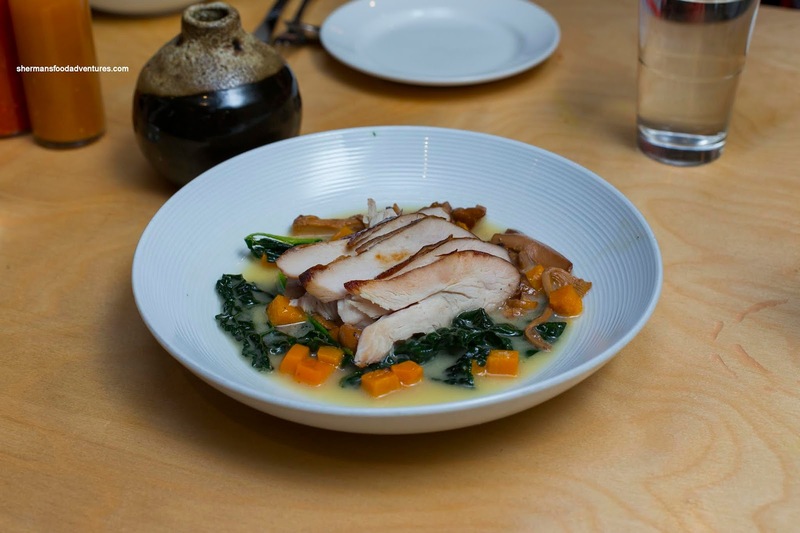 Viv had the Smoked Turkey Breast with golden chanterelle, squash and kale which was completely different than what we had in our minds. This was actually a good thing because the dish had some good surprises. First, the turkey was moist, tender and smoky with a well-rendered crispy skin. Second, the broth/sauce was rather acidic which brightened up an otherwise mild-tasting dish. The play on smoky and tangy was an unexpected, but tasty combination. Unfortunately, the kale (like the shrimp and oxtails) was too salty. My son ended up with the most impressive dish with the Brisket Dinner featuring white bread, BBQ sauce, home fries and sautéed cauliflower. 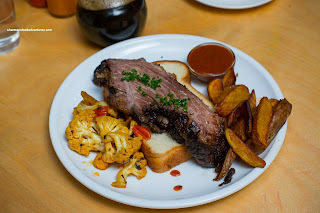 The large slices of brisket were reminiscent of the one we had at Franklin (according to him). 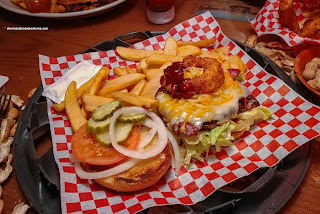 I tried it and it was smoky, peppery and melt-in-mouth tender. Yes, I would have to agree with him. The BBQ sauce was more on the vinegary side though, went well with the home fries. For dessert, we shared both the Chocolate Apricot Bread Pudding and the Spiced Apple Cranberry Betty. As the name suggested, nestled within the soft and slightly dense bread pudding, there were nuggets of dark chocolate and apricot. It wasn't overly sweet where we could taste the slight bitterness of the chocolate combined with the sweetness of the apricots. 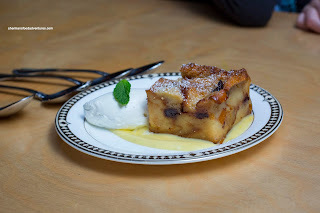 The orange Anglaise went really well with the bread pudding as it was lightly sweet and citrusy aromatic. 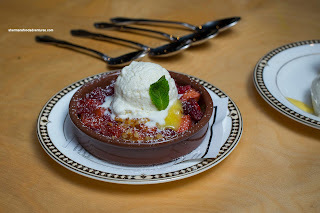 For me, I loved the Betty as the crunchy bits were a lovely contrast to the soft, sweet and tart berries and apple. Again, this was not an overly sweet dessert despite the visuals which meant the ice cream could stand on its own where the end taste of bourbon really came through. To add another layer of sweet tang, the lemon curd did just that. These were 2 nice finishing touches on a pretty tasty meal. Yes, it wasn't perfect and some might even think that JuneBaby doesn't live up to the accolades, but I am more pragmatic. Considering the price point, it was still an enjoyable experience. As long as the Experience Music Project has been around since 2000, I've made it a point to visit whenever I was in Seattle. Fast forward 18 years and the place has already changed names a few times and now is known as the Museum of Pop Culture or MoPOP. With the Marvel: Universe of Super Heroes exhibit there until March 3rd, 2019, we decided this was as good of a time to go. However, with anything in this blog, food is most important. So we had to eat prior to going in! 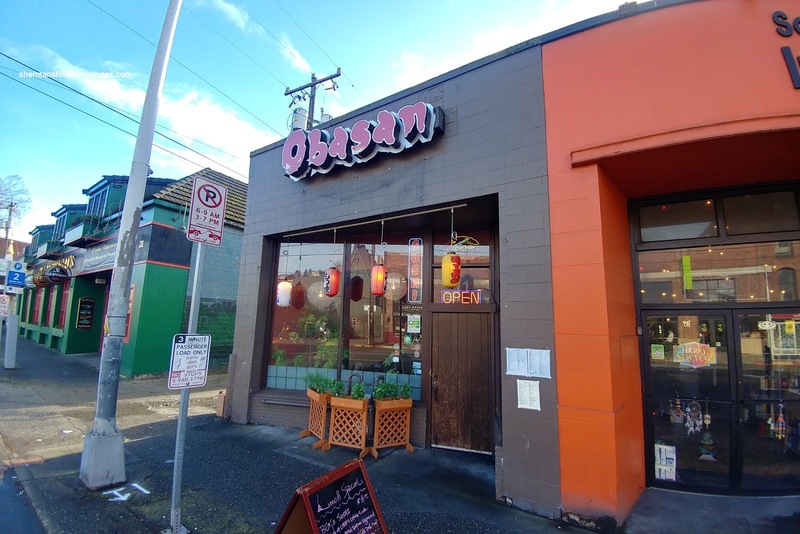 We decided on casual Japanese and conveniently enough, Obasan was in the neighbourhood. My son went for something simple in the Sake Don. If I had to directly compare, this was a bit smaller in terms of the amount of salmon than the one found at Fremont Bowl. However, there was much more rice (although you can refill at Fremont Bowl). Fish quality was quite good being buttery and fresh-tasting. Loved the amount of furikake underneath the fish and the small amount of wasabi. Good flavours and chewy rice. All around good bowl. 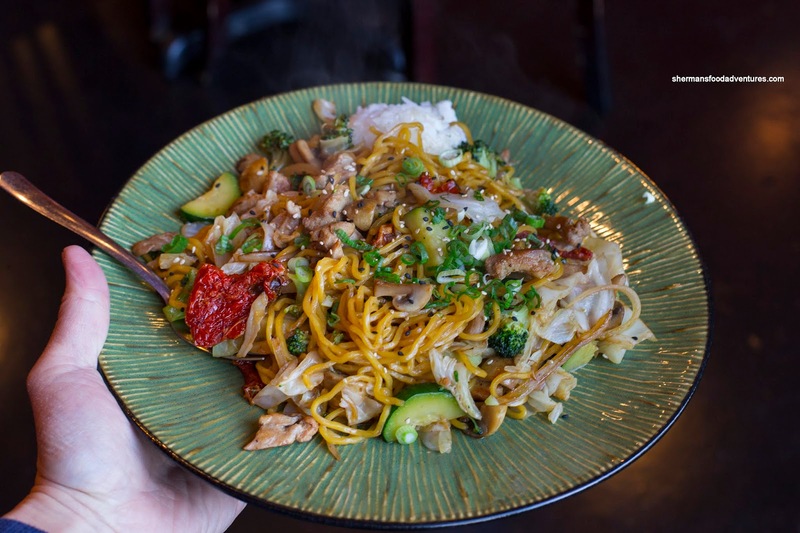 My daughter ordered the Chicken Yakisoba and we were all a bit surprised as to the portion size. It was humungous! Not sure why there was a scoop of rice on the side, but she ate some of it. We found the noodles to be a bit clumpy and dry, but I guess the lack of oil made it healthier. The dish was rather bland though, in need of both salt and tang. There was a decent amount of tender chicken and plenty of veggies. Interestingly, there was sundried tomato too which added some kick. 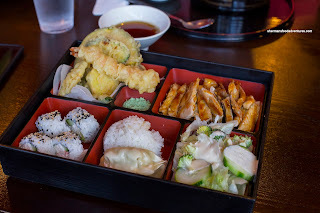 For myself, I had the Chicken Teriyaki Bento Box which also included tempura, salad, rice, gyoza and California roll. 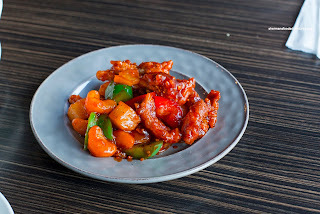 Without the skin, the thin slices of chicken were a touch dry and lacking aroma, but there was more than enough sweet sauce to help counteract both issues. I thought the tempura was excellent with a crispy thin coating that wasn't greasy. 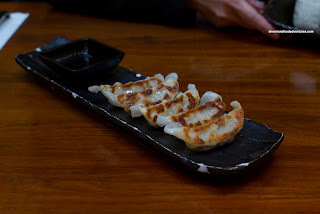 Not sure if I really liked the gyoza as they were the steamed variety (without a crunchy sear). However, the dumpling skin was thin and the filling was tender. 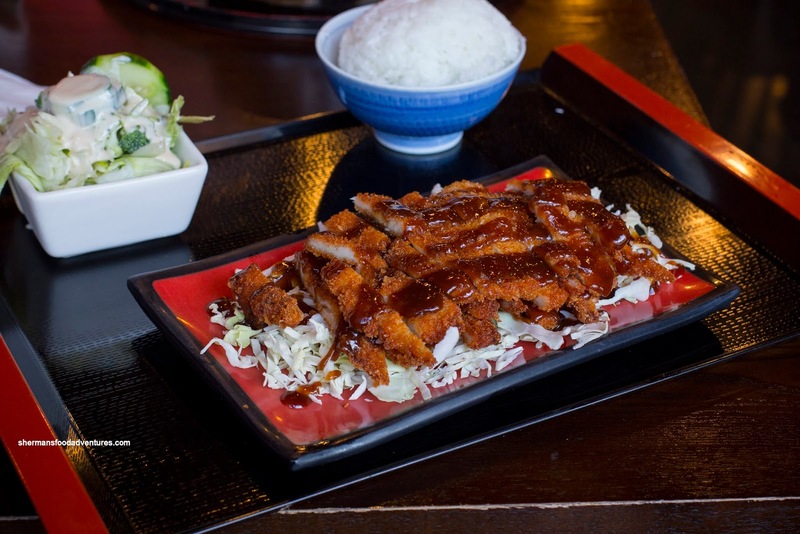 Viv went for the Chicken Katsu Teishoku served with rice and salad. Also featuring thin slices of chicken, the katsu was really crunchy, but lacking in meat texture. There was plenty of it, so she was pretty full in the end. 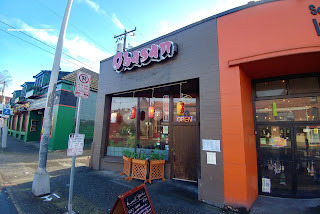 Overall, Obasan did the job for our lunch with decent eats. Prices are on the higher end though. Normally, when one thinks of Chinese New Year dinner, a 10-course spread including soup, lobster or crab, fish, chicken, pork and beef come to mind. It represents many different things, in particular, prosperity and wealth. If one was to eat out for CNY, many restaurants offer such dinners. The usual suspects include Kirin, Red Star, Western Lake, Chef Tony and many more as the list is endless, especially in the GVRD. 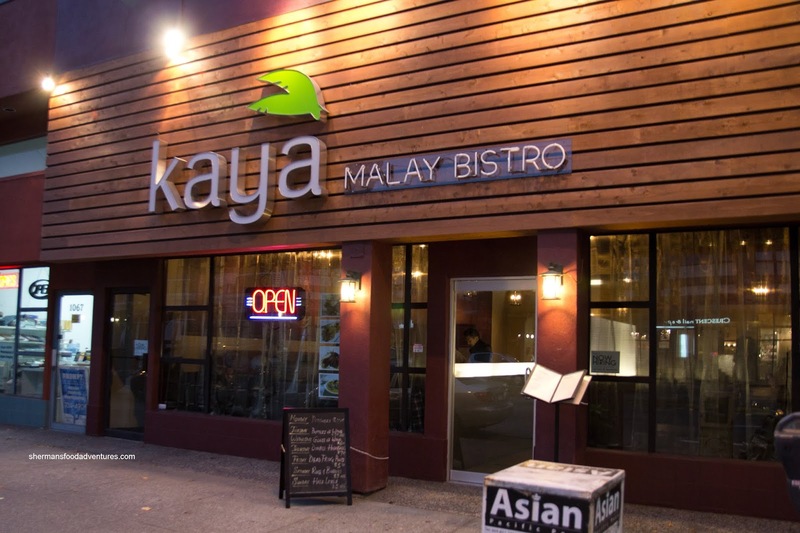 However, did you know that Kaya Malay Bistro offers up their own CNY 8-course dinner? 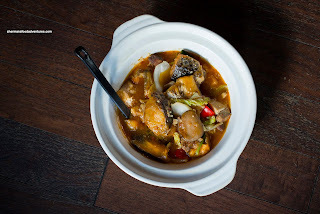 Now you might think this sounds rather strange, but for the many ethnic Chinese in Malaysia, they celebrate CNY with similar dishes, but also ones that are unique. This is where Kaya comes in, giving the opportunity for us to experience a Chinese Malaysian CNY meal. I was invited recently, along with Jacqueline, to try it out. 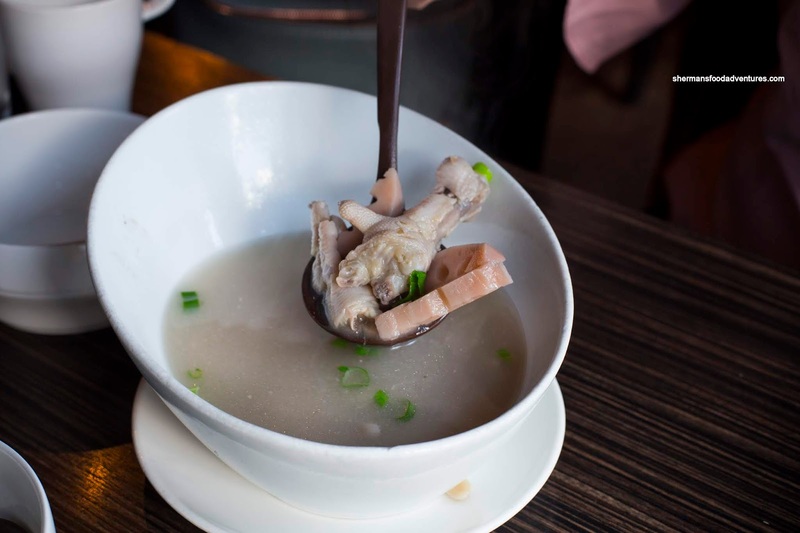 We began with the Lotus Root Soup with chicken feet and peanuts. For us, this was a classic Chinese homemade soup that wasn't complex on the surface, but definitely good for the soul. It was lightly silky with the natural sweetness from the chicken feet coming through. Subtle aromatics all around where the salt content was restrained. Personally, I love lotus root and the ample slices were tender while retaining a sticky bite. 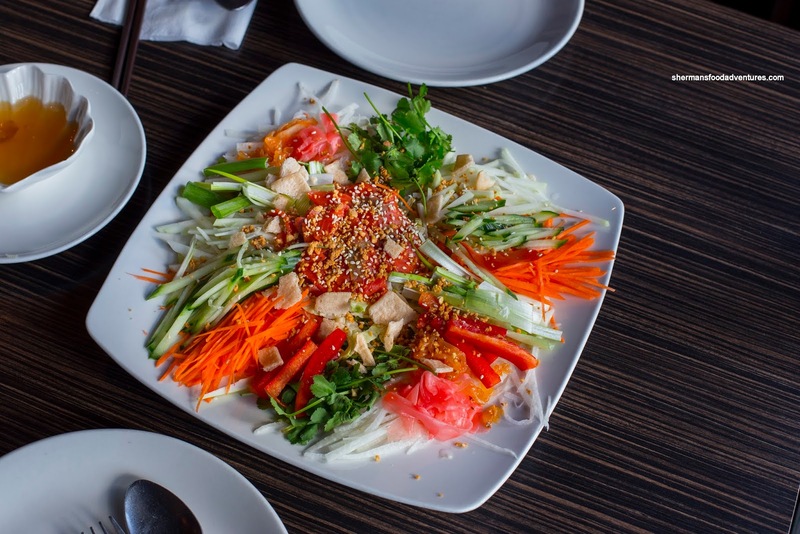 Next up, we were presented with the Smoked Salmon Yu Sheng Salad consisting of julienned carrots, cucumber, daikon, scallions, red pepper, cilantro, marinated jellyfish, pickled ginger, wonton crisps and smoked salmon. The smoked salmon took the place of raw fish as Kaya isn't known for their sushi. To properly eat the salad, one must "Lo Hay" or mix the ingredients. That we did and yes, the textures were abundant as well as the combination of tangy, sweet, salty and the unmistakeable essence of cilantro. My favourite dish was the Fish Head Hot Pot featuring local salmon. 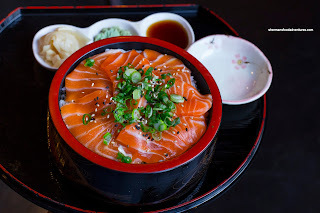 Normally, one would find cod or basa in this, but the salmon gave the hot pot more body. With that being said, the salmon was not heavy nor overcooked. 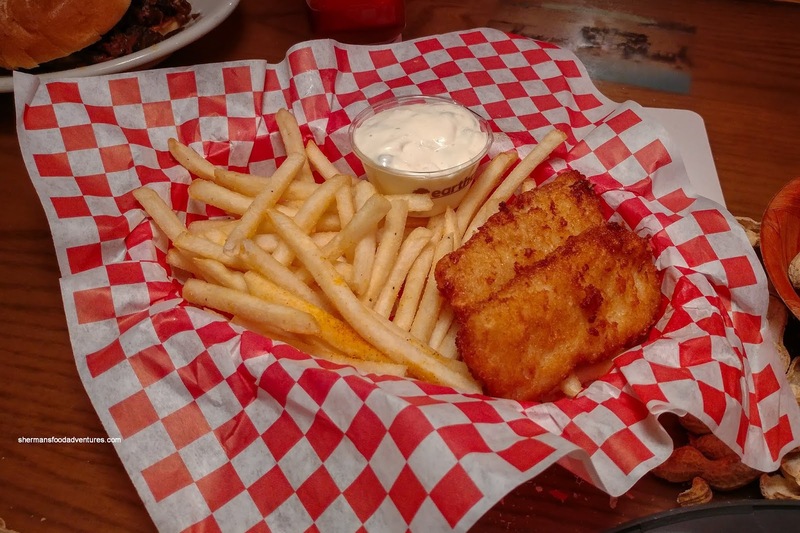 It was flaky and moist with almost a cod-like texture. Loved the tang in the sauce really helped brighten up the flavours of the sauce. Hidden within, we found the usual fried tofu, napa cabbage and roasted pork. Presented as a smaller portion (since it was only Jacqueline and myself), the Kumquat Chicken was full-flavoured. Yes, the sauce was essentially a sweet n' sour, but there was a unique sweetness from the kumquat. I found the chicken to be tender with a uniformly cooked exterior batter. 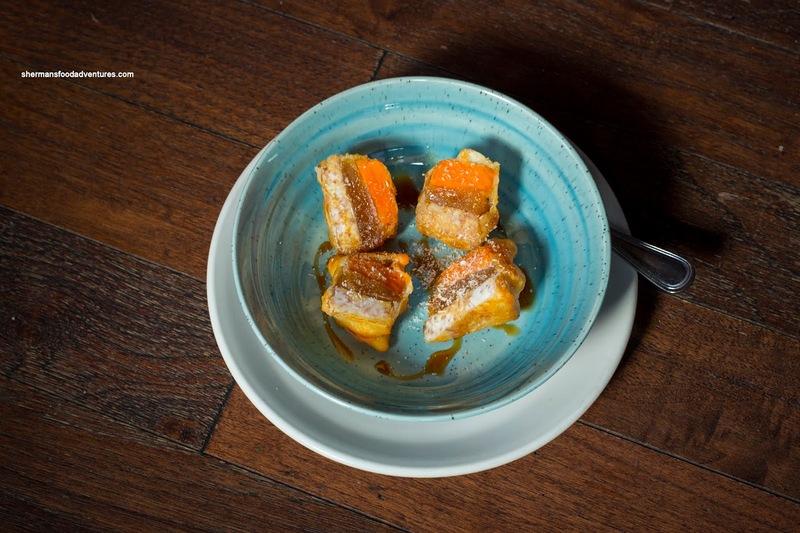 The addition of Mandarin orange segments added pops of natural sweetness. 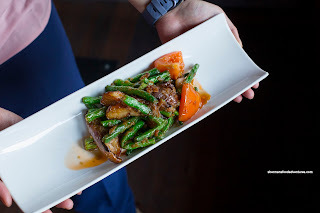 To get some veggies into the meal, we were served a Malaysian dish in the Wok-Fried Green Beans and Eggplant with tomatoes and shrimp. I've had this dish several times before at Kaya and it was as solid as usual with crunchy, yet cooked-all-the-way-through, green beans and tender eggplant. The version here, compared to other Malay restaurants in town, tends to be sweeter with less spice. There was good wok hay which meant there was proper carmelization with no moisture leakage from the veggies. Another favourite of mine was the Braised Lamb Shank. 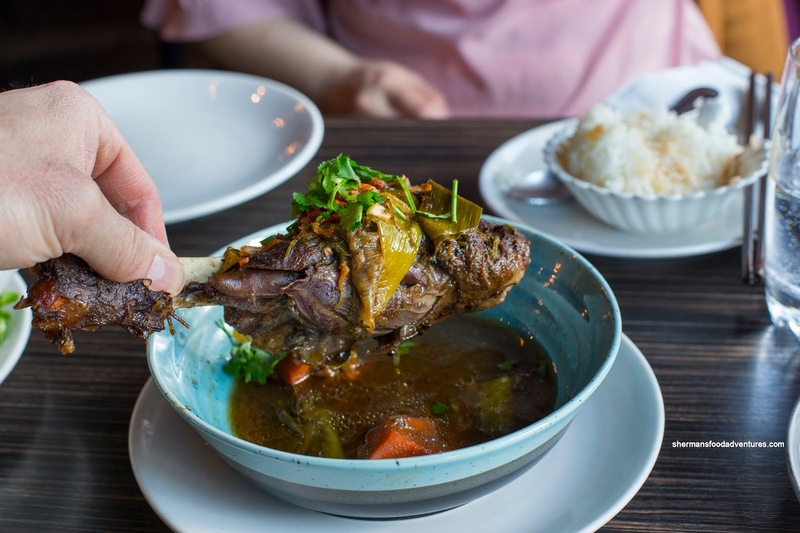 No joke, this was one of the best executed lamb shanks I've had in a while (including fine dining restaurants). This was perfectly and uniformly tender with the classic gelatinous texture from the lamb. Flavours were impactful without being salty. 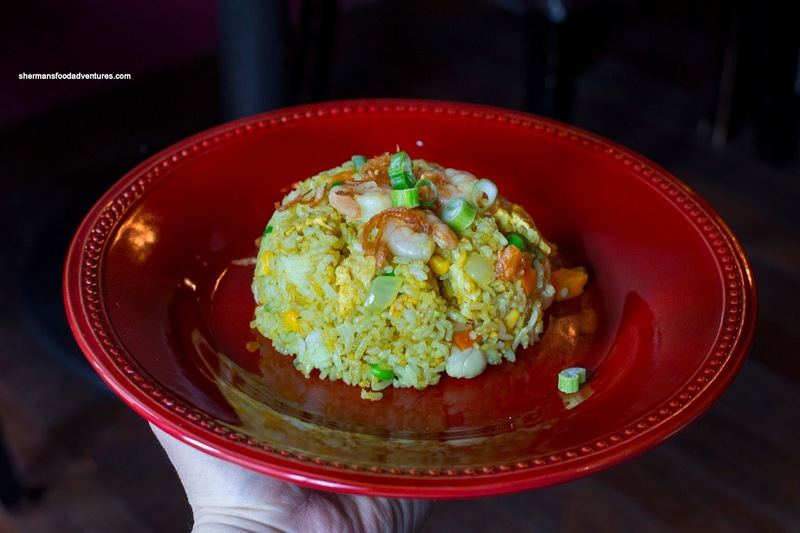 Of course the meal ended off the main dishes with a carb being the Seafood Golden Fried Rice. This was chock full of tender baby scallops and large crunchy shrimp. There was good wok heat where the rice was chewy and fragrant. There was enough seasoning so that the rice could stand on its own without the need for any condiments. To finish, we were served the Malaysian Nian Goa with sweet yam and taro. These were deep fried with a thin crispy exterior giving way to a sticky and moderately sweet nian goa. I found the yam and taro a bit firm, but the flavours really worked. Moreover, there was quite the textural contrast. 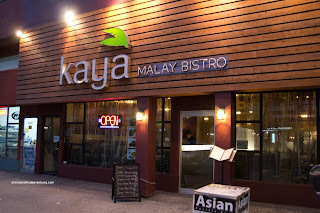 So that's the Malaysian Chinese New Year dinner one can find at Kaya. I would say this is pretty unique and ultimately tasty as well. It costs $38.00 per person for a minimum table of 4 (dish sizes will be bigger than what we had). Continuing on the theme of "restaurants that we pass by but never ate at", we ended up at Jimmy Mac's Roadhouse. 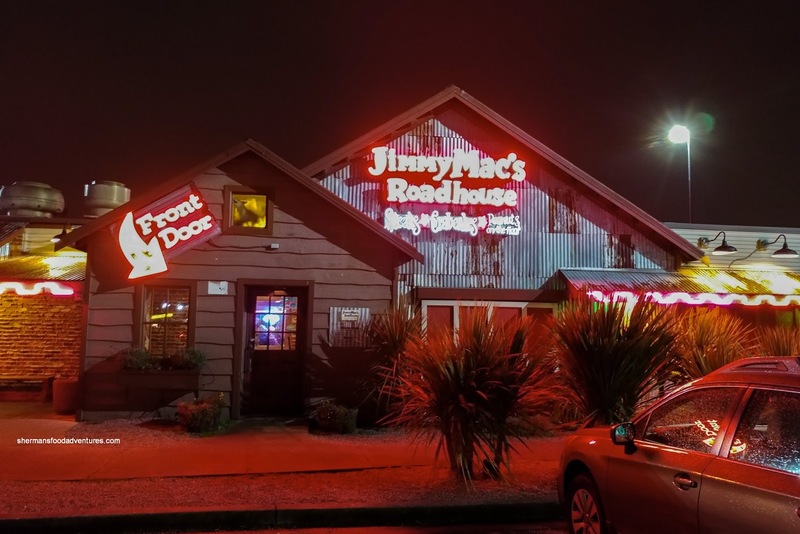 For all the times we have shopped at the Walmart in Renton and all the times we drove by on our way to Feast Buffet, it was about time we actually went inside Jimmy Mac's. After playing mindless games at the nearby Family Fun Center (trying to collect points for useless prizes), we made our way to Jimmy Mac's for a late dinner. The Texas-style diner encourages you to chuck your peanut shells onto the floor, so yes, the place looks like a mess, but has its charm. 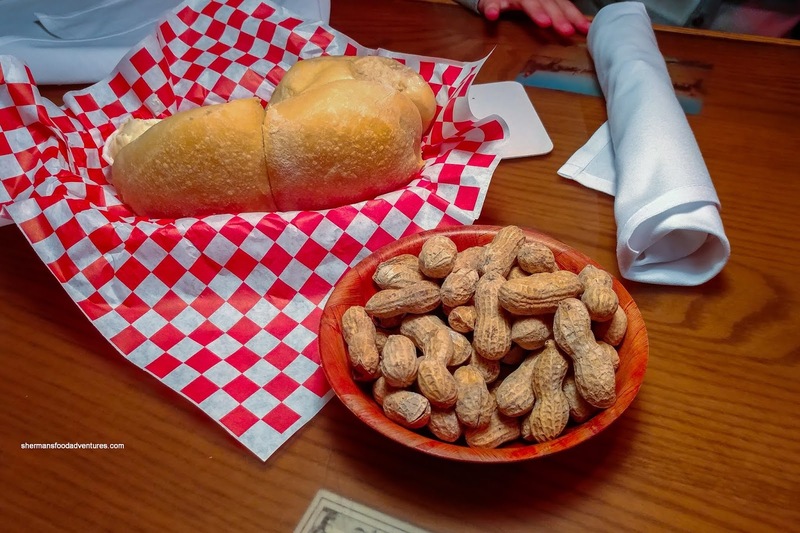 Not to stand out and not fit in (although we looked like the Huangs from Fresh off the Boat at Cattleman's Ranch), we did gather a bowl of Peanuts and proceeded to throw them at each other and litter the floor. Wait, let me rephrase that, the kids and I chucked them at each other. Viv did her best Jessica Huang impression and played no-fun mom. Also complimentary, we were served their sweet and warm Yeast Buns with enough butter to rub onto Kramer (check the turkey episode). We couldn't stop eating them! 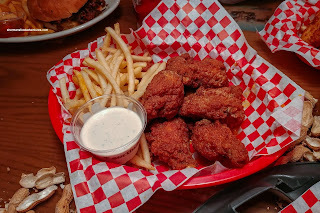 Onto our first actual appie, we got the Hot Wings that were surprisingly served with skinny fries. I'm not sure where they get their wings from, but they were gigantic. Beyond the slightly thick batter, the meat was tender and juicy. We thought that the wings weren't hot enough where the glaze was more butter than hot sauce. Loved the ample amount of blue cheese dip on the side, they didn't skimp! For my main, I went for the Campfire Cheeseburger with Swiss, cheddar & Jack cheeses, bacon and a crispy onion ring slathered in BBQ sauce. Again, this was pretty large as well and even the amount of pickles and lettuce was excessive. No matter, I enjoyed the combination of ingredients as it was hearty and definitely not lacking flavour. The well-charred patty was a little dry though, but the rest of the stuff inside did help alleviate that. The bun was soft, but held everything together. I liked the steak fries as they were meaty with lots of potato texture. Oh and serving in on a hubcap was pure awesomeness! 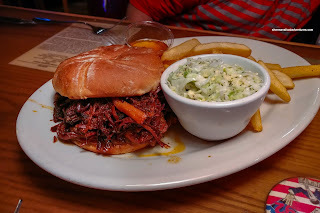 My son decided on the Pulled Pork Sandwich that was of course, large. He could only finish half of it. The pork was on the drier side though, but flavourful from their top secret pig pucker sauce. It was more of a sweet vinegar glaze rather than a BBQ sauce per se. It actually helped lighten up the heaviness of the pork. For Viv, she was disgusted with all this gluttony and decided on the small size of the Boulder Grilled Chicken Salad. 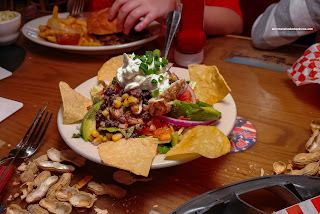 This sported greens tossed with cheese & chili-lime vinaigrette, tomato, avocado, onions, sliced chicken breast, black bean corn salsa and sour cream. She was shocked that this was a small as she didn't finish it either. It was definitely hearty while the flavours were a bit conflicting in her opinion. The sweet and vinegariness of the dressing was fine, but didn't seem to go with the random splashes of BBQ sauce. Otherwise, things were fresh and the chicken was tender. 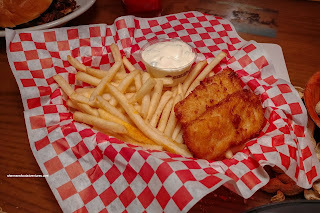 For my daughter, she wasn't very hungry and ended up with the Kid's Fish & Chips. This was not bad since the cod was fairly moist and flaky. However, the batter was a bit thick and parts of the fish touching that was a bit dry. Alright, the food ain't refined nor was it particularly healthy, but for me, the place has charm. Big portions and reasonable prices, I would go back. - Peanut shells on the floor! Although it isn't a "must visit" restaurant when it comes to the Seattle food scene, I've been trying to eat at Kizuki Ramen & Izakaya for the past 5 years or so. 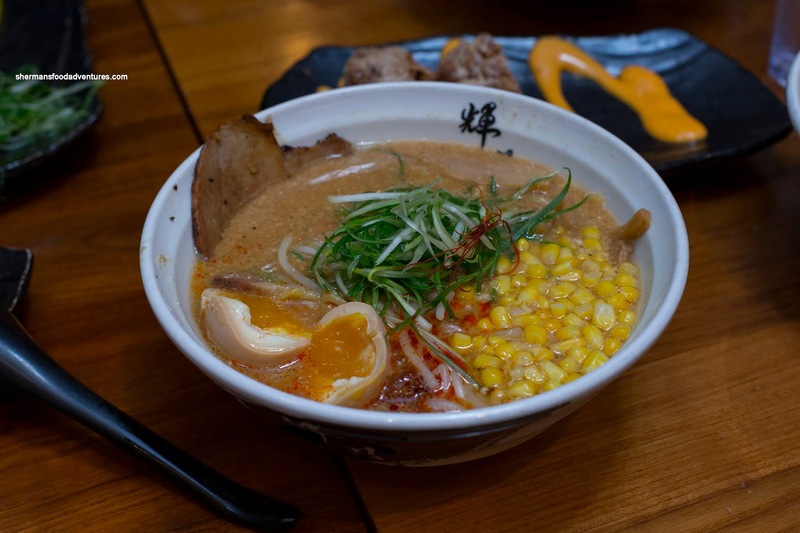 Since my kids love ramen, it has been in my back pocket as an eating destination if the situation arose. Well, we just didn't end up needing it and my several visits to Seattle a year didn't yield any visits to Kizuki. 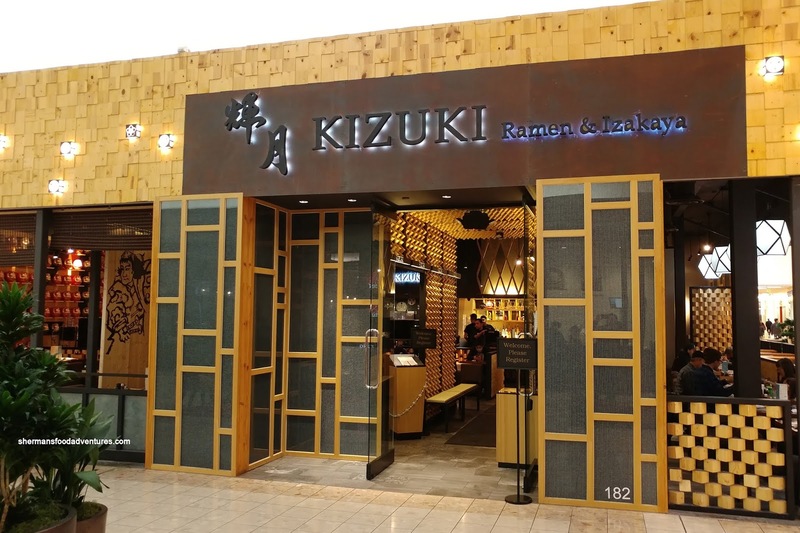 Finally, as we were heading South on the I-5 towards our hotel in Renton, we figured that it would be best to avoid the height of Seattle rush hour and hightail it to Kizuki at Southcenter instead of eating in the North and being stuck for who knows how long. Since we arrived in the middle of the afternoon, the place was calm and we got a great seat facing the mall. 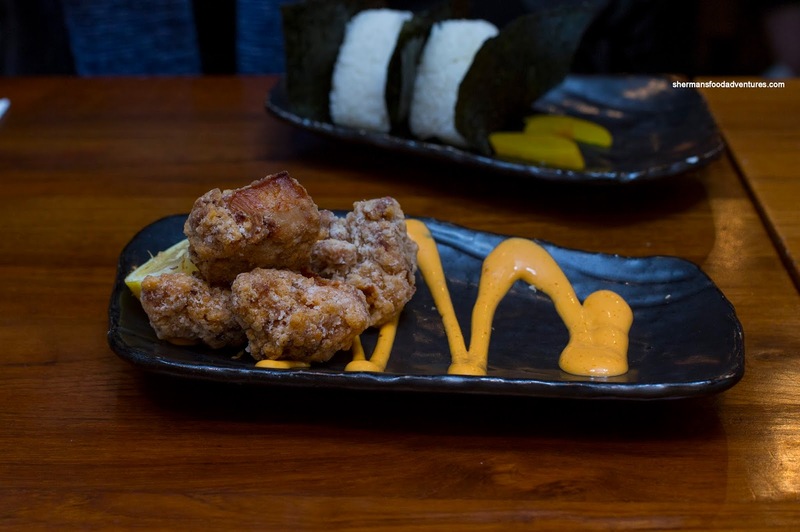 To start, we got an order of the Chicken Karaage and Pork Gyoza. 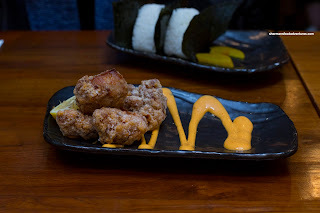 Personally, I like my pieces of chicken karaage to be a bit more bite size due to many factors. One of which is that there is less chance of under cooked batter. The large pieces we had here did suffer from that. Mealy and doughy, some of the batter in the cracks were indeed undercooked. However, being larger in size, the dark meat was tender and juicy. The slightly spicy mayo underneath was a good compliment to the chicken. As for the gyoza, I found them to be acceptable. They were smaller in size, but that was absolutely fine. The dumpling skin was medium-thick while the bottom was somewhat crispy. I enjoyed the tender meat filling as it was well-seasoned with the right amount of greens. We also got the Tuna Mayo Onigiri which was "okay". I thought the rice was nicely textured being chewy and dry enough. Everything held together alright without chunks falling all over the place. Inside, the tender morsels of tuna were plentiful and we liked how there was minimal amount of mayo. However, the whole thing didn't taste like anything. I realize it isn't supposed to be a flavour bomb, but really, it was completely devoid of flavour. 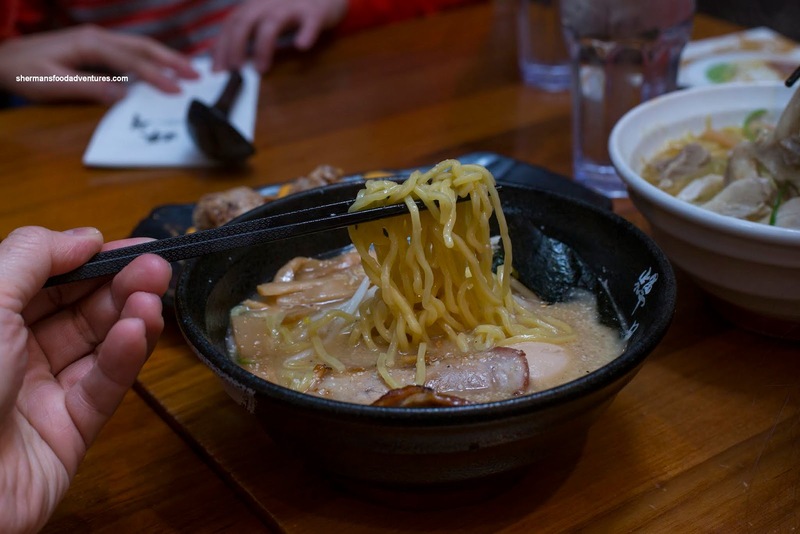 Onto the ramen, my son decided on the Garlic Tonkotsu Shoyu Ramen (limited quantities) with an extra rich broth spiked by tonnes of garlic. That promise was completely realized when we tried the broth. It was silky, super garlicky and definitely porky. Although the shoyu was definitively there, it was completely brushed aside by the ample garlic. Noodles were chewy and didn't soften too much and the egg was perfectly runny and well-seasoned. The one large slice of chashu was smoky and charred, but since it was lean, it was a bit chewy in parts. However, one could add pork belly instead for $2.00 more. For myself, I had the Spicy Miso Ramen with a rich pork broth, Hokkaido miso paste and garlic paste. 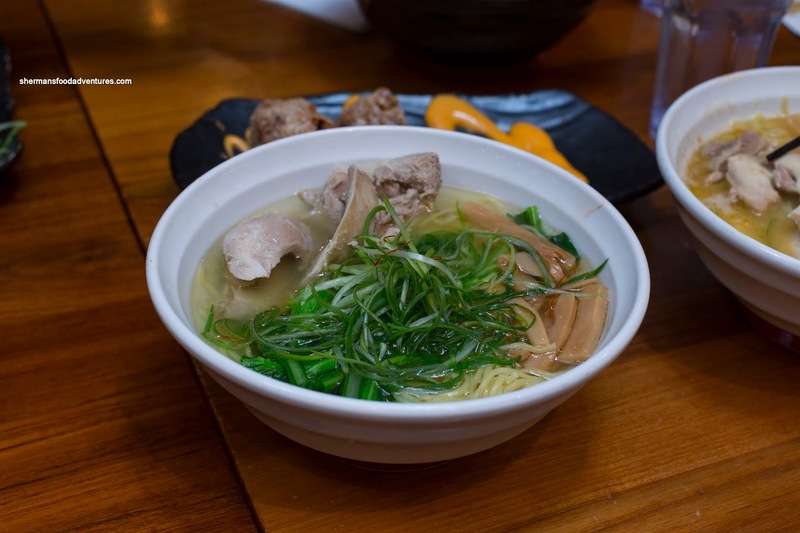 This broth was also silky, garlicky and full of umaminess. It wasn't really all that spicy though. Again, the egg and chashu were the same while the portion size was on the smaller side. 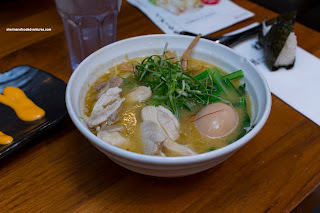 My daughter wanted to do something different and had the Chicken Rich Ramen with large chunks of chicken, yau choy, bamboo shoots, a whackload of green onion and egg. Again, the promise of a rich chicken broth was completely valid as the fatty oil slick added body to an already thick broth. There was no mistaking it was chicken and the level of umaminess was high. I would say that all of the broths so far were tasty, but on the saltier side. We were not that enamoured with the chicken as it was dry and lifeless. Viv stayed on the same theme but went lighter with the Shoyu Chicken Ramen with the same toppings as the rich ramen minus the egg. 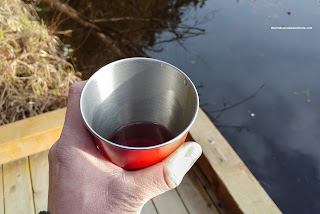 Furthermore, the broth was clear and devoid of the oil slick. As such, it ate as a clear broth that was still flavourful, but with much less impact. Overall, we enjoyed the food at Kizuki. It wasn't the best we had, but above-average at the very least. After a fabulous stay at the Fairmont Waterfront as part of the Talking Trees Package, we were treated to brunch at The ARC Restaurant downstairs. 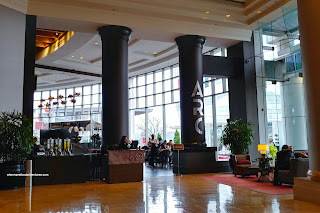 It was hard to pack up and leave the luxurious digs we were afforded, but as they say, all good things must come to an end... Having a chance to dine at the ARC was a good thing because I haven't been back since they re-branded from the ol' Heron's. One thing is for sure, their dining space is still awesome with floor-to-ceiling windows with a view of the waterfront. 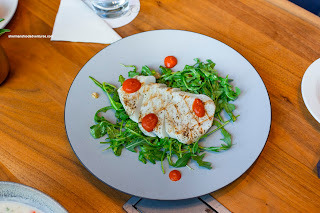 We ended up sharing some appies to start including the Grilled Humboldt Squid with fried chickpeas, arugula and charred red pepper sauce. The large piece of squid couldn't be any more tender. It was buttery soft, yet at the same time was still appealingly chewy with a nice rebound. Although the red pepper sauce was pleasantly sweet with a slight bite, the dish could've used more pop. Creamy and rich, the ARC Chowder featured Ocean Wise certified fish and clams, roasted vegetables, double smoked bacon and Yukon Gold potatoes. This was super chunky and yes, ate like a meal. The fish was cooked perfectly being flaky and soft while the ample amount of clams were buttery. Other than the brininess, there was the smoky saltiness of the bacon as well as the crunch of the veggies. 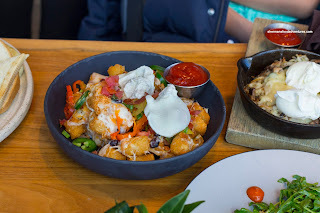 Not really an appie, but certainly ate like one, the Breakfast Nachos featured fried tater tots, bacon, scallions, two organic eggs, black beans, cheddar, Monterey Jack, mozzarella, sweet and hot peppers and fresh cut salsa. I mean, what's not to like about perfectly fried crispy tater tots? Try slapping on the aforementioned ingredients as well as 2 perfectly soft-poached eggs. Lots of flavour going on including sweet, salty, smoky and spicy to go with the silky egg yolks. Yes, one person could eat this as a main, but ideally this is best shared. If one was really hungry, the Longshoreman's Breakfast would be the best choice. 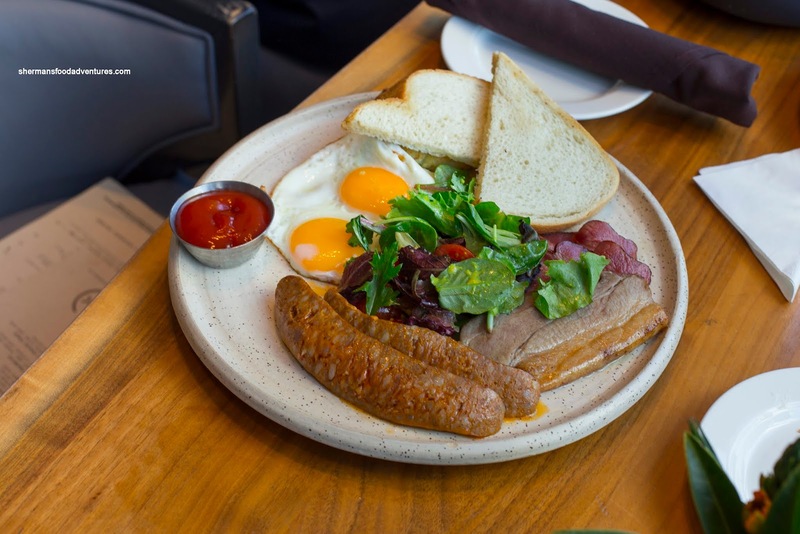 It consisted of two fried organic eggs, Kaseller ham, griddle sourdough toast, maple pork belly, Postmark IPA chorizo, smashed potato cakes and heirloom tomato salad. Nothing much to say other than that all of the components were well-prepared. 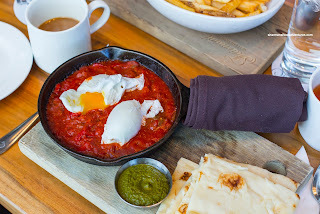 For myself, I tried something different in the Lamb Shakshuka with spicy lamb sausage, organic eggs, grilled pita bread and chermoula. This was much more impactful and flavourful than all of the other dishes so far. Beyond the initial tangy tomato, I could definitely get the cumin and harissa. The lamb sausage was meaty and slightly spicy. Loved the silky and runny egg yolk which helped provide balance. On the side, the chermoula added a soothing garlicky lemon hit. 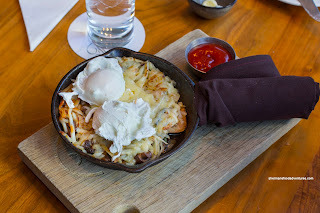 My daughter also went for something off the brunch menu in the Wild Mushroom Roesti with shredded potato, wild mushrooms, spinach, Emmental cheese and two sunny side up organic eggs This was hearty and cheesy with the aromatics from the crisped up potato as well as the earthiness from the wild mushrooms. Despite the absence of meat, this was fulfilling and full of depth. 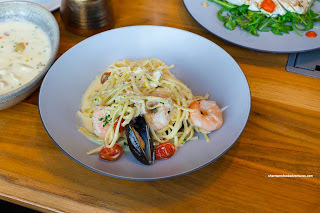 Viv decided on the regular lunch menu with the Seafood Linguine. 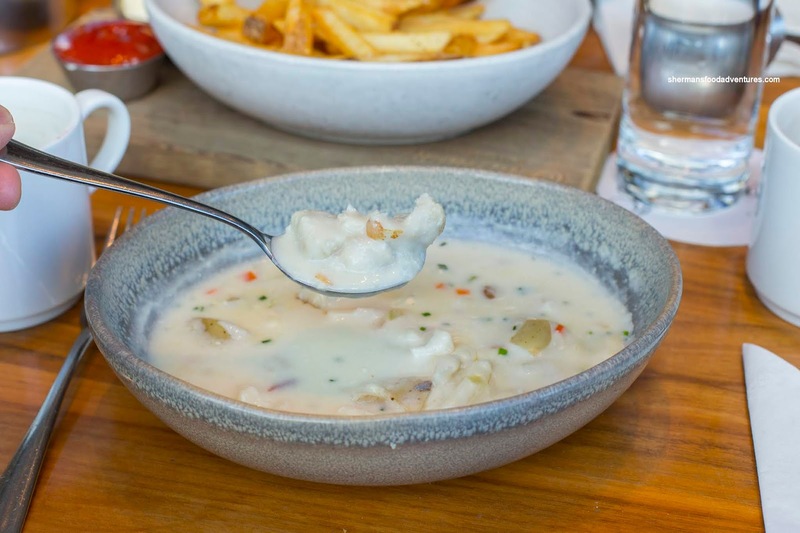 At first, we were wondering why it was $32.00, but the ample amount of dungeness crab leg meat made it more palatable (literally and figuratively). It was super cheesy and creamy with al dente noodles. No absence of flavour and the seafood was on point. Loved the pops of tang from the tomatoes. 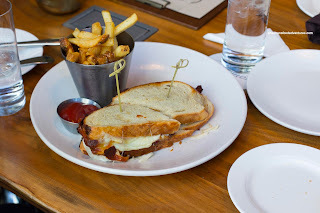 My son went for his ol' standby with the ARC Smoked Brisket sandwich with salty pretzel bread, house mustard, provolone cheese and thousand island dressing. This was pretty good with tender slices of fatty brisket Lots of complimentary flavours from the ingredients within firm enough bread to keep things together. The side of fries were on point being crunchy and hot. Overall, there isn't much to complain about the food and atmosphere of the restaurant. Prices are definitely on the higher end, but that's what you get considering the location and overall ambiance. If a first-time visitor to Vancouver asks you where should they stay and what should they do, there are some pretty standard answers. 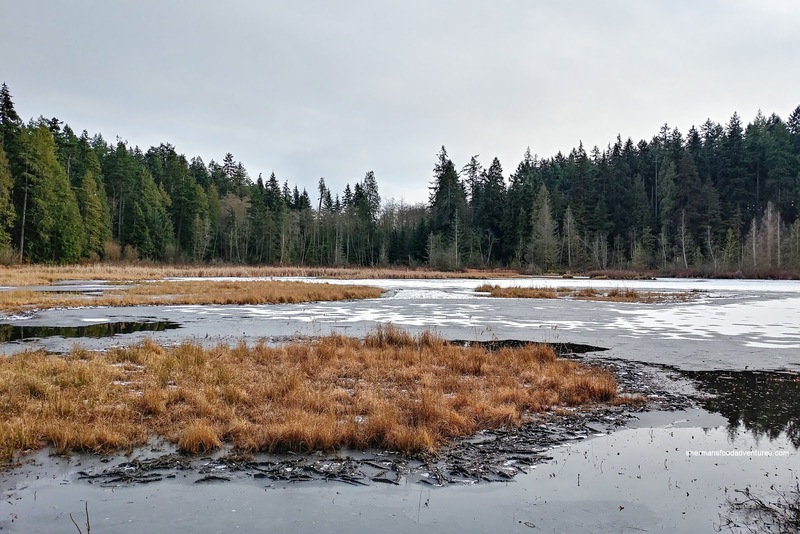 If we talk about activities, we get the usual Capilano Suspension Bridge, Science World, Grouse Mountain, Granville Island and of course Stanley Park. Now if one wanted a more unique and truly local experience, many of these would be classified as "touristy". However, I recently participated in something a bit different with the Talking Trees Tour by Talaysay Tours. 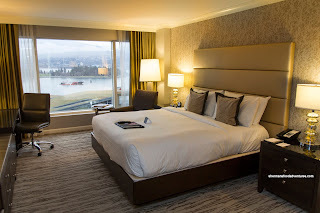 They have partnered up with the Fairmont Waterfront to provide a complete experience including a stay at the hotel and a 4-course dinner inspired by the Tour. Let’s talk about the tour first. It is run by Talaysay Tours by mother and daughter team Candace and Talaysay (it is named after her). 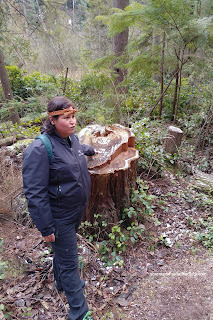 The Talking Trees tour focuses on the indigenous foliage in the area (in this case Stanley Park) and their many uses by the indigenous peoples. This is only one of the tours that are available. Back to the Talking Trees Tour, we were shuttled by the hotel to meet up with Candance and Talaysay in the Stanley Park train parking lot. 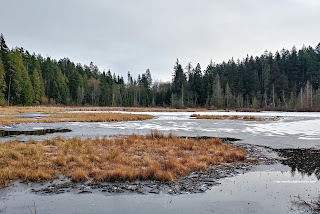 From there, we made the short walk to one of the trails. 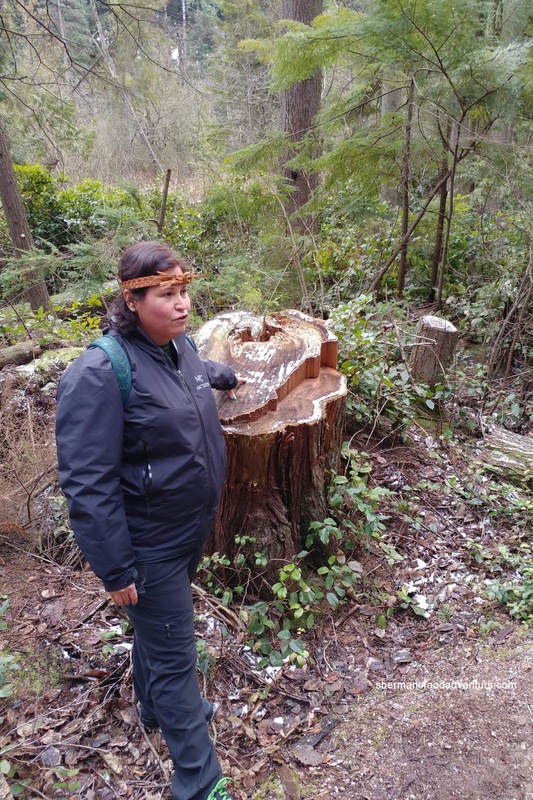 For roughly 90 minutes, we were taught how various trees and plants were used not only for medicinal purposes, but how were used for food and building materials. This was a low impact walk with many stops and also hot tea near the end. After being shuttled back to the hotel, we had some time to refresh before heading down to The Arc restaurant for a 4-course dinner consisting of local ingredients and items found on the Talking Trees Tour. 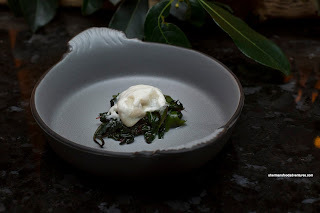 We started off with an Amuse Bouche consisting of an Oyster with herring roe, kelp and hemlock & eucalyptus emulsion. This was a simple bite that was briny and sweet with a background herbal essence. Next, we were presented with the Elk Tartare with elderberries, blackberries and hazelnuts with a side of bone marrow sabayon. As lean as the elk tartare can be, this one was still buttery soft and tender. 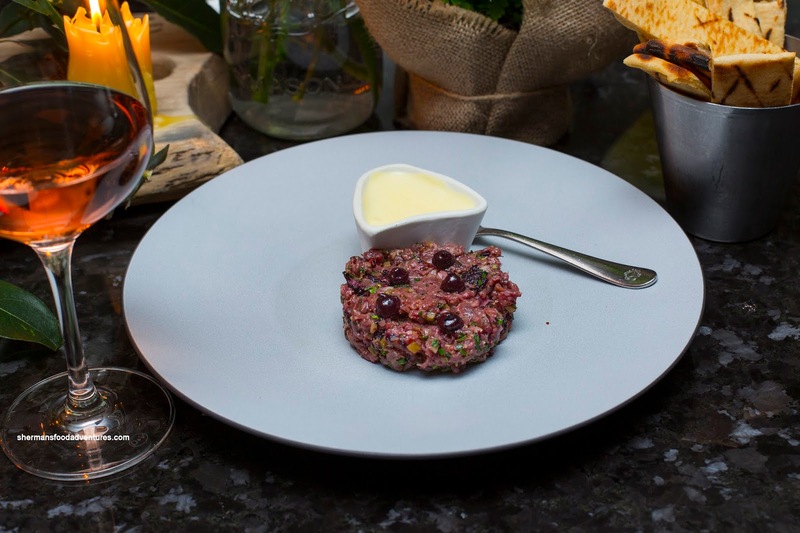 The bone marrow sabayon added the necessary fat to create body and add a meaty flavour. Loved the little pops of sweet tangy berries as it added sweetness and acidity. Normally, I don’t talk about flatbreads very often, but the one here was perfect, being fluffy and soft with a firm exterior char. 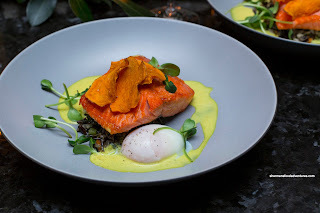 Onto the main dish, we had the West Coast Salmon Kedgeree with wild rice, 63 degree egg and madras curry veloute. It was suggested we mix everything together including the salmon. 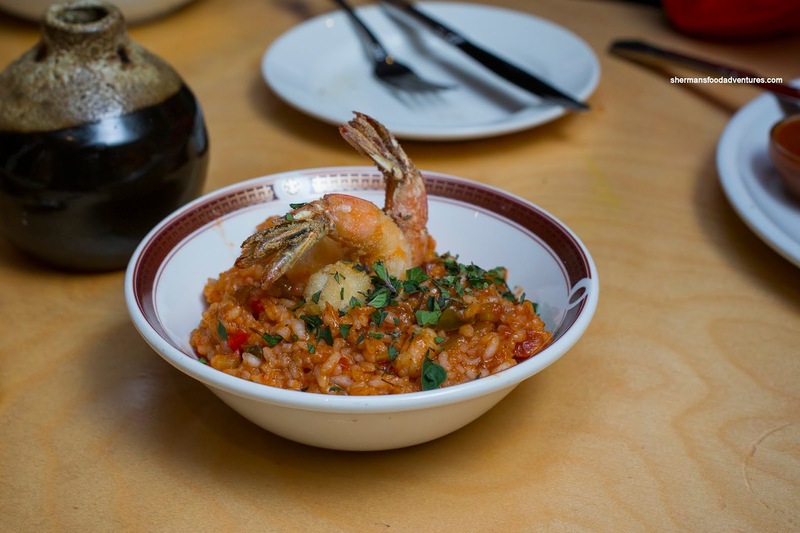 So we mashed everything up into a dirty rice of sorts and yes, it was very good. Loved the firm chewy rice and the tender flaky salmon along with the silkiness of the egg and aromatic creaminess of the veloute. There was just enough curry for aroma without overwhelming the salmon. 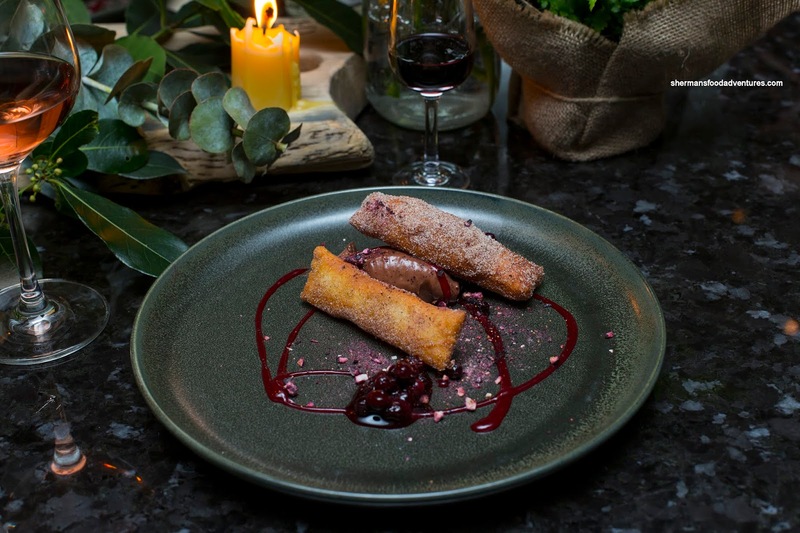 For dessert, we were served Fry Bread (Bannock) with berries and dark chocolate mousse. Coated in cinnamon sugar, this was a crunchier and chewier version of a churro. Naturally, the blueberries was a nice add to the dessert while the chocolate mousse was light, creamy and semi-sweet. Another great thing about the Talking Trees package is that it includes a one-night stay at the luxurious Fairmont Waterfront starting from $514.00 based on double occupancy. 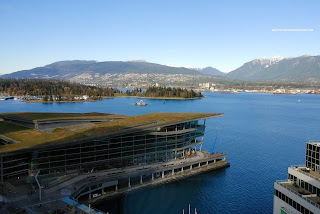 We were put up in a Signature Harbor Stanley Park View Room with a fabulous view of the Stanley Park and the North Shore. Tastefully appointed with plenty of space, the room featured a 47" flat-screen TV and a comfortable Sealy Posturepedic king bed (2 doubles available too). 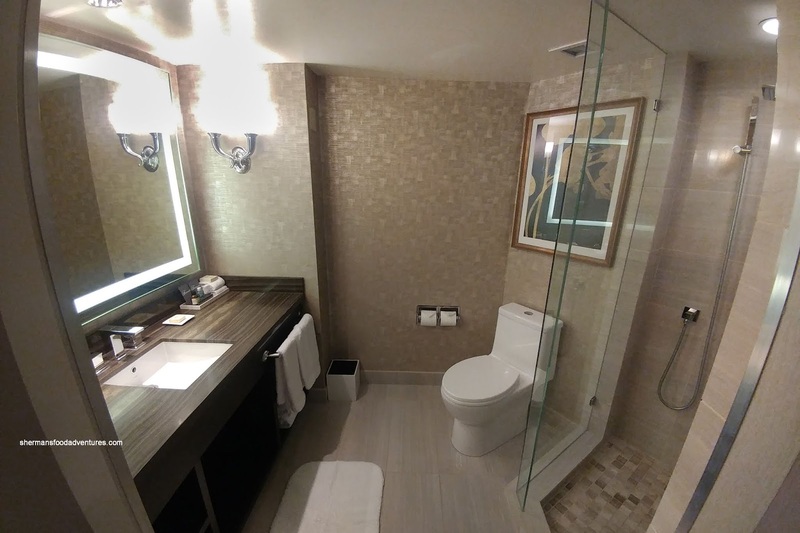 Our bathroom came with a large rain shower, but could be had with a bathtub as well. Toiletries were Le Lebo Fragrances branded under the Rose 31 line. They were a large 90ml size and I barely put a dent into them for one night. Soap bars were plenty big as well. Yes, they did not skimp on anything. Probably the best feature of this 20th floor room was the outstanding view. I caught myself just staring out the window on many occasions. However, with its convenient location across the street from Canada Place, there was no reason to just sit in our room (despite the cold weather). 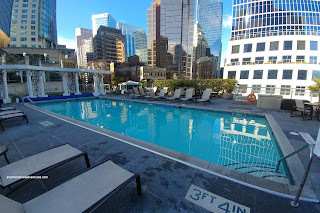 Even then, the heated outdoor pool was beautiful (with also a view of the harbour) and warm enough to use. But in reality, a quick dip into the adjacent hot tub kept things from getting too frigid. Overall, I thought the Talking Trees package was original and well-priced. Starting at $514.00CAD (Fairmont City View Queen), you not only get a stay at the hotel, it includes a 3-course (4-courses with the amuse bouche), walking tour and transportation to and from Stanley Park for 2. Worth checking out if you are a visitor to the city or live in the city itself.